Tucson is one of the oldest cities in the United States. It is located in southern Arizona, near the border between the U.S. and Mexico. The greatest wealth of the city is its diversity of cultures, architecture and people. It is believed that Tucson has a unique way of combining the best of both worlds - the progress and innovation of the metropolitan community and the friendly and informal atmosphere of small town. Traditions of local people, their homes and landmarks are the result of a fascinating mixture of the culture of Native Americans, Spanish customs, Mexican lifestyle and Anglo-American architectural thought. The biggest landmarks of Tucson are the mountain hills of the Catalina mountains, located north of the city and rising to over 2800m. altitude. Tucson is surrounded on all four sides with beautiful hills. To the east lie the Rincon Mountains, and the Tucson Mountains to the west. It is often called Optics Valley, as in the city are very focused companies producing optics. The town is famous as the "astronomical center of the world" as the optical equipment from Tucson science has the ability to explore space. Tucson is not a typical American city. Evidence of this is the center of town, which, contrary to expectations is not clogged with skyscrapers. The tallest building in Tucson is called UniSource Energy Tower. The 100-meter building was built in 1986 and is considered the most exalted in the city. Another building, attracting the attention of the visitors, is the building of the Bank of America. Since Tucson is a regional center of Pima County, also located in the city are the beautiful buildings of the regional governments, most memorable of which is the Pima County Courthouse. The complex was built in 1928, in Spanish Revival style. The landmark is listed on the National Register of historic sites in the USA. The greatest appeal for residents and visitors is the local Fox Tucson Theatre. The building dates back to 1930. Over time, several decades after its inception, the theater had begun to lose its glory and becoming a decayed and forgotten building. In 1997, however, a group of enthusiasts from an NGO decided to give new life to the local theater. This culminated in 1999, when the renovated stage again welcomed guests. The theater is located downtown, at 17 West Congress, and today has become a symbol of the caring and traditions of Tucson. A religious emblem of the city is the St. Augustine Cathedral. At the end of March is held a colorful local festival. The event happens on 4th Avenue and is called the Fourth Avenue Street Fair. During this, the boulevard turns into an arena of craft, talent and marketing. If you decide to visit the city in late January and early February, you will have the opportunity to become involved in a rare event – an Exposure of gems, minerals and fossils. Another pride of the city is the University of Arizona. There is evidence that Tucson has been inhabited by ancient ancestors more than 12 000 years ago. In the Santa Cruz River, through Tucson, scientists have found supplies of former farmers from 4000 years ago. Locals are convinced that the 360 sunny days in the year and location near the Sonoran desert create a unique lifestyle and opportunities for adventures around the U.S. city. Tucson was founded in 1775 by Hugo O'Connor. In translation from the Spanish, the city name means "the foot of the black hill" as the city is close to an old volcanic area. 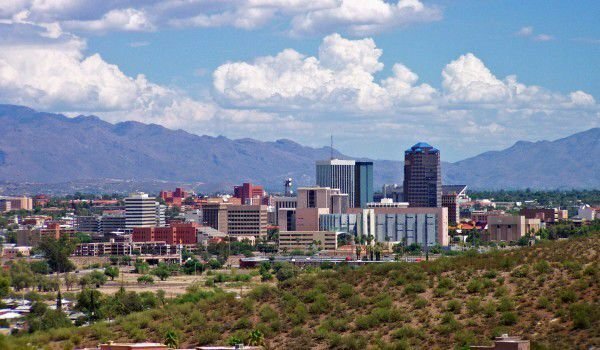 The city is increasingly recognized as one of the top destinations in the U.S. Tucson is 118 miles from Phoenix, and about 100 kilometers from the border with Mexico.